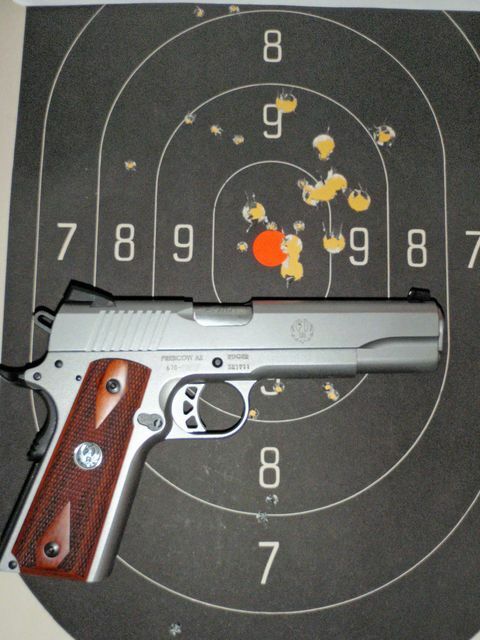 ﻿ HuntingNut » Forums » Firearms, Shooting & Reloading » Gun & Firearm Discussions » Ruger SR1911 finally got shot! Ruger SR1911 finally got shot! Posted: Sun Dec 22, 2013 11:31 pm Post subject: Ruger SR1911 finally got shot! Well, I got this Ruger back in May and I finally had time to go shoot it! I'm not too happy with my shooting, the rust really shows, but I like the gun! Ten rounds (200 grain SWC over 5.0 grains of Bullseye) at 15 yards. The group measures about 3.75". Ignore the .22 holes, I was "recycling" the target from another shooter. Posted: Mon Dec 23, 2013 12:06 am Post subject: Re: Ruger SR1911 finally got shot! Nice gun Mike, a few practice an you will get the group shrinking. Posted: Mon Dec 23, 2013 1:14 am Post subject: Re: Ruger SR1911 finally got shot! Its dead....what more do ya need???? keep us posted on how you improve. Posted: Mon Dec 23, 2013 4:21 am Post subject: Re: Ruger SR1911 finally got shot! Nothin' wrong with those shots Punkin...as Elvis said...its dead mate. If you are carrying it, then a group like that at 15 yards in the centre of the "seen mass" would make one helluva mess mate, and it would be all in your favour. Having said that, keep practising...time what's not spent shootin', huntin' and fishin' is time wasted mate. Posted: Mon Dec 23, 2013 6:34 am Post subject: Re: Ruger SR1911 finally got shot! Well I think it is horrible. You better send it to me and let me check it out. I will pay for the one way shipping. Posted: Mon Dec 23, 2013 8:04 am Post subject: Re: Ruger SR1911 finally got shot! Gee that's a purdy gun. I wish I could shoot one of those, they're too darned big for me and too darned powerful, I bet my groups would be way worse unless I had a bench rest. I really like the metal finish. Get out there and plink some more! Posted: Mon Dec 23, 2013 8:34 am Post subject: Re: Ruger SR1911 finally got shot! Suz, all it takes is practice mate. I've seen rather petite young ladies handling full house 1911 Colt .45 pistols without any problems. All it takes is range time and plenty of rounds for practice. Posted: Mon Dec 23, 2013 2:56 pm Post subject: Re: Ruger SR1911 finally got shot! Good for you Mike, I ordered one thru the LGS in late Aug and expect it around Feb/2014. Posted: Wed Dec 25, 2013 3:05 pm Post subject: Re: Ruger SR1911 finally got shot! Haven't put my hands on one of these yet but from what I hear they're getting great feedback !!! Suz, don't sell yourself short......with the right training you'll be amazed at what you can handle. It's proper technique that gives you the skill and ability to shoot larger calibers.